Marshall got off to a winning start to the season with a hard-fought win over Miami in Week 1. There is a lot the team needs to work on, but it had to encourage fans to get in the win column to start off the year. This is the seventh straight season I'm doing the mid-major report for Doc's Sports. How have the selections on the mid-major betting report done? Overall, the record is 40 wins and 29 losses with a gain of $1,500. We are coming off an 8-5 year with a small gain of $40 last season when following the MTSU Blue Raiders. We had some bad luck on the larger plays last year, but finished strong to get into the green for the season. This year, I'm following the Marshall Thundering Herd. Why Marshall? I've selected them because I feel like they are a team that will bounce back in a big way from last year's ugly 3-9 campaign. This is a program that was accustomed to winning a bunch of games, and results like last year's won't be tolerated for long at all. I think they'll be significantly better. I'll be following beat writers, following players and coaches on Twitter, and reading the press conference transcripts to find information on the Thundering Herd. I'll be looking to make myself an expert on this Marshall team. There will be a selection on each game at the end of the weekly article. We'll be using the Doc's Sports Unit Betting System for every pick , which will allow readers to follow along and track the results. Keion Davis decided to make a major impact on Marshall's season opener. He didn't take long to do it either. Davis returned the opening kickoff 99 yards for a touchdown to get Marshall off to a 7-0 lead. After Miami kicked a field goal to close to within a point of Marshall (14-13), Davis took another kickoff to the house. This time Davis went 97 yards and gave the Thundering Herd an eight-point lead. Miami's Gus Ragland threw only one interception last year, but he threw a really important pick in last weekend's game. Chris Jackson picked him off and ran it back 72 yards for a pick-six to put Marshall up 28-13 in the third quarter. In all, Marshall had three non-offensive touchdowns and only one offensive touchdown in last week's game. Interestingly enough, Marshall's lone offensive touchdown came on an 11-play scoring drive that started on their own two-yard line. It was a strange game to be sure, but Marshall ended up winning 31-26 as they knocked down Ragland's pass into the end zone as time expired. Miami had a bunch of statistical advantages. The Redhawks had 25 first downs to 15 for Marshall. Miami had 429 yards of total offense and Marshall had just 267. Marshall was only able to average 2.4 yards per carry in the contest. Marshall's special teams won them the game on Saturday night, and their offense will have to be better going forward. Last week's play on Marshall -2 was a winner, so we start the season 1-0 on the selections. -Grant Traylor, Marshall beat writer for The Herald Dispatch, wrote about NC State's defensive front and the tremendous challenge they present for Marshall's offensive line. B.J. Hill and Justin Jones are two massive defensive tackles that clog up the interior of the line. Hill is remarkably strong, and he's one of the best interior linemen in the country. Chubb is an elite pass rusher on the outside at defensive end. Chubb is a guy the NFL scouts absolutely love, and his quickness on the outside is amazing. Marshall coach Doc Holliday said this week he believes this NC State defensive line is made up of four NFL players. Marshall center Levi Brown sees this as a chance for the Thundering Herd line to step up against an elite front. Brown said, "Going against them, you know that if you have a good game, you are going to turn heads. That's exciting for us to know." -Doc Holliday spoke this week about how important the strength and conditioning program has been for the Marshall defense this year. Because of the two kick return touchdowns and the interception run back for a touchdown, the Marshall defense spent a lot of time on the field last week. Holliday gave the game ball from last week's win to the strength coaches because of how well prepared the unit was for extra time on the field. -Marshall senior safety C.J. Reavis is suspended for the first half of this game due to a targeting penalty from the third quarter of the win over Miami. Reavis is a leader on the Marshall defense, so this is a big loss. 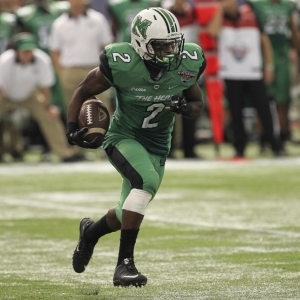 -Marshall is 0-7 against the spread in their last seven games following an ATS win. -NC State is 11-3 ATS in their last 14 nonconference games. -The 'under' is 4-0 in Marshall's last four road games. -The under is 4-1 in NC State's last five home games. NC State opened as a 22.5-point favorite at Bookmaker. NC State is now a 24.5-point favorite over Marshall after some steady money has come in on the home favorite. The posted total opened here at 55.5 points. It has edged down to 55 points across the board. The Marshall Thundering Herd are a team I believe in as a much-improved team, but this is a tough spot for them. NC State is coming off a disappointing loss in which they lost a game where they outgained their opponent by a wide margin. The Wolfpack have a high upside, but this line is looking a little inflated now. I believe Marshall's defense can do enough to keep them closer than the line would suggest. Still, I am a little more confident of a lower-scoring contest than Marshall covering the spread. NC State's defensive front is just too good, and I don't see Marshall scoring all that many here. I'll go with a two-unit play on the under and a one-unit play on Marshall +24.5.